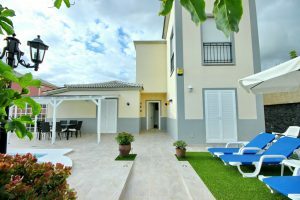 For Callao Salvaje villa holidays, try out this lovely new villa with private heated pool and air conditioning. It also enjoys amazing sea views. We have just spent a brilliant 2 weeks in Callao Salvaje Tenerife. We booked a three bedroom villa through Karen from Holidays 4U. We were met on arrival by a very nice local lady who spoke very good English and showed us around the villa. A generous welcome pack had been provided which even included a bottle of prosecco. We really appreciated that. The weather was very hot, so we were relieved to find out that the villa had air conditioning throughout. We travelled as family of 6 (2 parents and 4 children), so the villa was a perfect size for us. Our children adored playing and swimming in the pool. There is a Lidl in Callao Salvaje now, which wasn’t there on our last visit. So we did a lot of shopping there and cooked our own meals most days. But we did go out and sample some of the fine restaurants on a couple of occasions. With a large family, it can be costly to do this every night. We hired a car, which was handy and the parking was very easy outside the villa, as it is situated in residential area. We drove to Siam Park for a day out once during the holiday, which the children really enjoyed. They tell me this was the highlight of the holiday. We felt the villa was very spacious, and very clean when we arrived. The kitchen was very well equipped with the usual appliances that you would expect in a villa, such as a diswasher, washing machine, oven, tall fridge/freezer etc. There was even a water filter for drinking water. Villa Simone is one of our Las Americas holiday villas in Tenerife. The villa has six bedrooms and can sleep up to 12 people. It has a private heated pool. Have just returned from a fantastic holiday with my wife, sister-in-law and her partner. We stayed in a three bedroom villa in the centre of Las Americas. I was quite surprised to find a villa in such a perfect location, as generally you find they are located further back from the front line. Usually it is the hotels and apartment complexes that get the prime locations in the tourist resorts in Tenerife. The villa enjoyed a fantastic sea view from the upstairs terrace. It had a private heated pool with a garden and plenty of sun loungers. The villa was infact everything we hoped for and more. We had a lovely time. The villa was well equipped with a dishwasher and washing machine. There was wifi internet access and satellite TV including English channels. The owners also provided a DVD player with a selection of some very good films, which we enjoyed watching, including Return to Me with Minnie Driver, which was a bit of a weepy. As the situation was so good, it was easy to walk out to access all the amenities. There were supermarkets, restaurants and bars all within easy reach. We also spent a couple of days on the beach. But most days we spent lazing around the pool. We all found the beds were very comfortable. That is very important as it can ruin a holiday if you are deprived of sleep. The owners had left a welcome pack which included a box of chocolates. That was a surprise and a very nice touch. We booked through Holidays 4U, who looked after us very well. This three bedroom holiday villa to rent in Fanabe has a private pool. It also has air conditioning and comes with optional car hire. I stayed in a lovely villa in Fanabe for 2 weeks earlier this month. I booked through Karen from Holidays 4U. The villa was fantastic. We had a great holiday. The villa was spacious, modern and very comfortable. The kitchen was very well equipped and there was an excellent barbeque outside. We wanted to have a relaxing holiday with lots of home cooking, as my husband wanted some chill out time after having an operation. So it was great that cooking meals was so easier. There was a dishwasher as well which we used a lot. The cupboards had everything we felt we needed including pots and pans, dishes and cutlery and it was all good quality as well. There were lots of sun loungers around the pool which we also made great use of. The villa was very clean and we didn’t see one cockroaach in the villa, or they were in evidence outside on the street. The area is residential and therefore quiet. But there were still restaurants and shops in walking distance. Or on some occasions we took a taxi down to the sea front where there are plenty of amenities. It is the first time that we have rented this particular villa. But we have stayed in villas in Fanabe before and we are all really keen on this area. We all definitely feel that we would be happy to book this villa again if it is available for the dates of our next holiday. Or if not, we would be happy to book another villa from Holidays 4U, as they all seem to be of a very high standard and Karen is very trustworthy. Villa Chantelle is one of our Callao Salvaje holiday villas in Tenerife. It has amazing sea view, air conditioning and unlimited wifi internet access. We booked a large villa in Callao Salvaje Tenerife to celebrate my father’s 90th birthday. We were therefore an extended family group consisting of my parents, my sister and her family and my family. It meant we were a total of 8 people. The villa was therefore very spacious for our needs, as there were a total of five bedrooms. It meant that both daughters could have their own rooms, which was very nice. We were met on arrival by the owner of the villa, who showed us around and showed us how a few things operated. The outside area consisted of a heated pool and a hot tub. There was also a barbeque and alfresco dining area. The villa was very clean when we arrived and the owner had even left us a welcome pack which included some wine and beers. That was very welcome on our first night as we arrived quite late. The kitchen was very spacious, allowing room for several cooks in the family. How lucky are we. But it was good to have the dishwasher, as it was my job to clear the dishes after dinner. The only negative I would say was that the floor inside the villa was marble tiles which were very shiny and very slippy when wet. It was a bit like a skating rink. We had to be very careful not to walk inside with wet feet. My husband did slip over once but luckily he didn’t hurt himself. The villa also had unlimited wifi, which we really needed. My husband runs a business and he needs to keep an eye on emails, even if not working. This Costa Adeje villa has four bedrooms and can sleep up to 10 people. Situated in the Del Duque area, it is close to the beach, restaurants and shops. We really enjoyed our holiday this month. 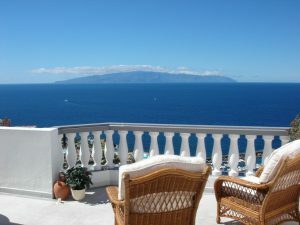 We booked a villa in the Del Duque area of Costa Adeje in Tenerife, through Karen Durant from Holidays4u.org. The villa was spacious, modern and comfortable. We had a private heated pool, with sun loungers around the pool. It’s where we spent most of the time, just relaxing, soaking up the sun, the occasional cocktail, reading a book and when it got to hot, a plunge in the pool. It was perfect! Everything was really close. The villa was in the best location. It’s why these villas are not the cheapest. It was close to the beach, restaurants, the Del Duque Shopping Centre, bars etc. Our party was made up of 4 adults and 4 children (2 families). The villa had four bedrooms, one of which had an ensuite bathroom. All the beds were very comfortable. The owners had been very thoughtful as there were lots of toys and games for the children. There was also a selection of movies including childrens’ films, which was a great touch and very useful. The weather was fantastic for our stay. Most days we just relaxed around the pool, but we did hire a car and explore on a couple of days. We visited Siam Park, which was very exhilerating and we also took a trip to the top of Mount Teide. It was a fantastic experience. You drive up the mountain. To start with the terrain is very green, but as you get higher up it becomes more and more barren. Before you get to the top there is a car park, where you can take a cable car to take you just below the summit. You would have to walk the rest of the way to the top, but you have to book this in advance. We were happy to go part of the way. The views were amazing. This is one of Fanabe vacation villas and has three bedrooms and two bathrooms. All the bedrooms have been equipped with air conditioning. 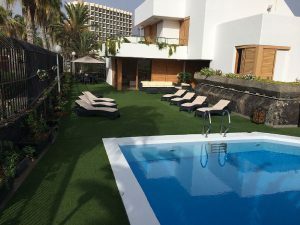 We have just returned from a one week holiday in a lovely privately owned self catering villa which was situated in the El Madronal area of Fanabe in Tenerife. The villa was an easy walk to amenities such as restaurants and shops. There was also a taxi rank nearby, so if we wanted to travel down to the sea front where there is a greater selection of restaurants, it was all very easy. The villa had a heated pool with plenty of sun loungers. I just love to sunbathe, read a book and when it gets too hot, just plunge into your very own private pool. To me that is what a holiday is all about. We were very lucky with the weather, it didn’t rain once, although it was forecast on our last day. There were 6 people in our party and everyone was comfortable as there was a large double bed and 4 single beds. The lounge was lovely and airy with comfortable seating and satellite channels on the TV. The kitchen was also very well equipped and included an oven and a dishwasher. We visited the beach on 2 or 3 days out of week and tried out the water sports, which was very exhilarating. We were happy just to chill by the pool on the other days. Will definitely book this villa again and if not available, would love to book another in the same area. We booked through Holidays 4U. A lady called Karen helped us and was very efficient in sorting out our booking from the start of our enquiry to sending us the key information. She was always very prompt to respond to any questions we had, regardless of how small. A fantastic Los Gigantes holiday villa with amazing sea and views of the Los Gigantes marina and cliffs. The villa has 4 bedrooms and sleeps 10 people. We booked a villa in Los Gigantes through Karen from Holidays 4U. The villa was very spacious and extremely well equipped. We had a really nice holiday and will definitely try to re-book for next year. The villa is in a very peaceful location and the views are stunning, but it was also an easy walk into the centre of Los Gigantes and to the beach. There is a lovely terrace with patio table and chairs, so we had quite a few meals there: watching the sunset across the sea was fantastic. The service was very good prior to our holiday and during the booking process. Karen provided us with very good directions which the owner had compiled. That was a very good help to finding the villa on our arrival day. The kitchen was very well equipped and included a dishwasher and a washing machine. There were plenty of cooking utensils and there is a barbeque outside. So cooking meals at the villa was very easy, even for our large party. The villa was very clean when we arrived and the owners had left a lovely welcome pack, which included some local wine, which was very interesting. Even the smallest things had been considered, tabs left for the dishwasher, toilet rolls, kitchen rolls, cleaning cloths, bleach all had been left for us, so we didn’t have to worry about buying those sorts of basics. The beds in the villa were all very comfortable (I was reliably informed by the rest of my family) and the rooms were very spacious with plenty of wardrobe space. All in all a big thumbs up. Thanks Holidays4U. A 4 bedroom 4 bathroom San Eugenio alto villa. The villa enjoys spectacular panoramic sea views and has a private pool, wifi internet and satellite TV. We have just returned from our very best holiday ever. We are a family of 6 people: 2 adults and 4 children. We always used to rent apartments on complexes with shared pools. But as the children are a little older now, we decided to give a villa with a private pool a try. I don’t think I can ever go back to booking an apartment. It was fabulous. To start with the view was to die for! Amazing sea views from both the pool area and inside the villa. There was also a barbeque area, so we could relax and chill out. The living area was really impressive as well. It was so spacious. What a wonderful place to chill out in as it also enjoyed the amazing views. The kitchen was so spacious with everything required for a self catering holiday, including lots of baking trays and casserole dishes, salad bowls etc. There was even a box of matches, which was really handy for lighting the barbeque and of course a wine bottle opener. Nothing was forgotten. All the bedrooms were spacious. We used all four bedrooms, so 2 of our oldest children could have their own room. So it really was a perfect fit for our family. We booked the villa through Karen from Holidays 4U, who was very efficient in dealing with our booking. We will definitely book this villa again and use Karen’s services again for our next holiday. Oh and there was wifi internet access, which was fabulous. We used hdmi cables to stream movies from our laptop via the Smart TV. As we have our own accounts with Netflix and Amazon, we were almost able to watch any film we fancied, as if we were at home in front of our own TV. 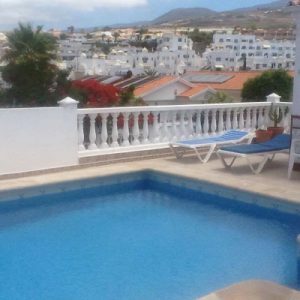 A beautiful three bedroom villa to rent in Callao Salvaje Tenerife. Situated on the Sueno Azul development this villa can sleep up to 6 people. We love coming to stay in the resort of Callao Salvaje and prefer to rent our own villa with its own private pool. This time we booked through Karen Durant from Holidays 4U. Would definitely recommend, was a good service throughout and the villa was also very nice. The villa we rented was very spacious, modern and well equipped. Outside there was a barbeque and the pool was gated and heated when we rented it (Winter months only I believe). The kitchen was very well equipped and included a washing machine and dishwasher. The owner also offered wifi on request, which was a real bonus, as both my husband and I run businesses so it was useful to keep an eye on incoming emails, even if we weren’t in full work mode. It worked well throughout the villa. The owners are very attentive and there was a nice welcome pack waiting for us on arrival which included wine, prosecco, water, bread, cheese, tea, coffee, butter, everything needed for a little welcoming snack before our trip to the shops the next moring. Would definitely book the villa again. Callao Salvaje is a quiet resort, but that is really what we wanted – some peace and quiet after our busy working schedule. There are a handful of restaurants and bars as well as supermarkets in walking distance. There is even a Lidl! Luckily the weather was also glorious apart from one rainy day. It made for a perfect holiday, with lots of pleasant memories created of an most enjoyable family holiday. A villa to rent in San Eugenio with air conditioning and wifi internet access. 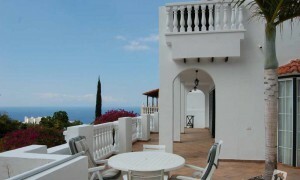 The villa also enjoys good sea views and has a private heated pool. Introducing a new villa to rent in San Eugenio with air conditioning and with lovely sea views, as you can see from the photo on the left. 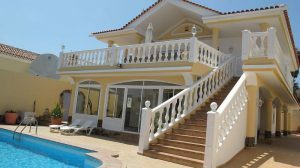 The villa has been built over 3 levels and is situated close to the Grand Sur Shopping Centre, which has a supermarket, as well as other clothes shops, restaurants and bars and also a cinema. The beach is also in walking distance, though it would be easier by car. 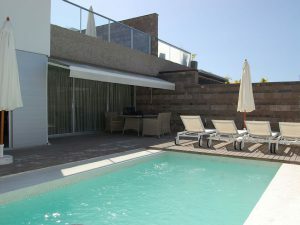 The villa has a private heated pool with a garden and sun terrace. A covered terrace is also home to a table tennis table and pool table, provided by the owner for guests to use. The villa also has wifi internet access and satellite TV. The lounge is spacious and comfortable and includes a dining table and chairs. The kitchen is fully equipped and includes a dishwasher and oven. There is a separate utility area with a washing machine. There are three bedrooms: two with a double bed and one twin room. The villa can sleep 8 people however, as an additional 2 fold-out beds are provided for the 7th and 8th person. There are two bathrooms and a separate toilet. The best places for hiking in Tenerife are the Teide National Park, Teno National Park and the Anaga Mountains. Tenerife is a great place for hiking. The walks are very isolated: you can walk for hours without meeting anyone. The best places for hiking in Tenerife are Teide National Park, Teno National Park and the Anaga Mountains. The ultimate challenge would be to descend to the peak of Mount Teide on foot which stands at 3,718m. But if that is too challenging, try Montana Blanca to the east of Mount Teide. at 2,748m it is the 3rd highest mountain in Tenerife. 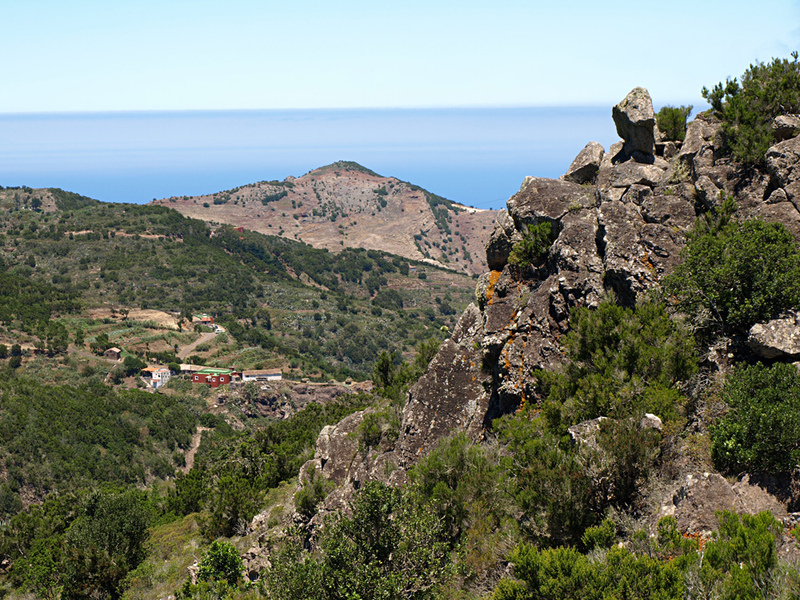 It is one of the most rewarding and easiest walks in Tenerife.